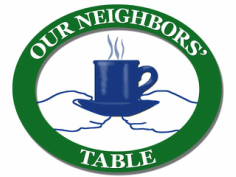 April 1 launches Our Neighbors' Table's annual restaurant campaign, Fill Your Neighbor's Plate! From April 1 - April 30, diners will have the option to add a "virtual meal" to their bill at participating restaurants. This "virtual meal" is a donation to ONT. The $10 option provides a week of fresh fruit, vegetables, meats and dairy. The $25 option provides dinner for a family of 4 at our Wednesday Meal for a month. Please visit our restaurant partners throughout the month of April to help fill the plates of your neighbors, so no one in our community has to go hungry. **If your restaurant would like to participate in the 2019 Fill Your Neighbor's Plate campaign this April, email or call Lesley Fawcett at 978-388-1907 x26. Visit any of the participating restaurants listed below and add a virtual meal to your bill as a donation to ONT! Fresh Plate $10 - provides a week of fresh fruits and vegetables, meat, eggs, and dairy. Family Meal $25 - hosts a family to our Wednesday Meal every week for an entire month.